30 numerals that adhere with Velcro® tabs. The hardcover book of "Chicka Chicka Boom Boom" is sold separately. The book is published by Simon and Schuster who does not manufacture or endorse the Prop Set. 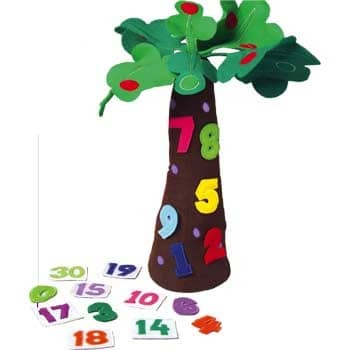 Follow along with the book with this rhyming climb up the tree is as easy as 1-2-3 with our freestanding, fabric tree and 30 numerals that adhere to it with Velcro® tabs. The hardcover book of "Chicka Chicka Boom Boom" is sold separately. *The book is published by Simon and Schuster who does not manufacture or endorse the Prop Set. Write A Review For Tree & Number Props for "Chicka Chicka 123"